Once upon a time, one of the marquee moments of Roman Holy Week was the Sistine Chapel performance of Gregorio Allegri's arrangement of Psalm 51. 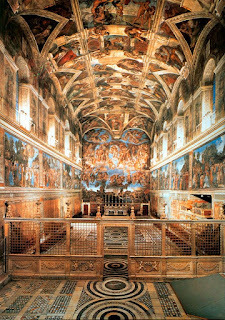 And, with Michelangelo's "Last Judgment" looming over the flocking crowds, that's exactly how it was intended to be. In today's language, the Vatican had exclusivity rights to the event -- the Popes so jealously guarded their control of the piece that any attempts to circulate its score or stage it elsewhere placed the culprits under automatic excommunication. Think of it as an appointment set to music. Anyways, 130 years after its premiere, the monopoly ended in 1770, when a 12 year-old from Austria departed the Sistina following the ritual and, returning to his lodging, promptly transcribed the entire piece. If he were around today, they'd probably call him a gossip. Looking back, though, we tend to identify the code-breaker by his surname: Mozart. Thousands might've tried since... yet for it all, the centuries have proven that neither can really be topped. A blessed and peaceful Holy Tuesday to one and all. Hope it's coming along as it should... even with as many ways of making it happen as there are the number of us.